This easy-to-play I Have, Who Has? 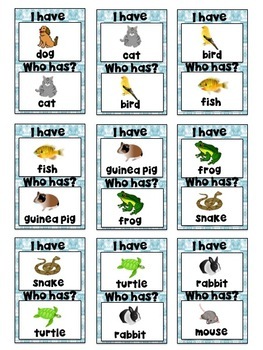 game is a great way to practice essential language skills with the whole class or small groups. 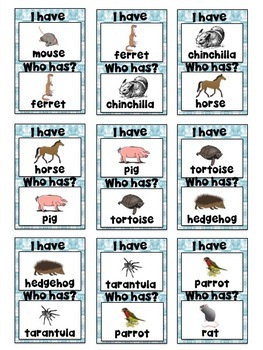 Students practice their listening, speaking and reading skills while practicing and reviewing vocabulary about pets. This is probably THE most engaging and fun way to teach vocabulary and early reading skills to your students, and trust me, they will love this activity! Includes two sets of 27 cards, in original background and pets themed background. The pictures and words are identical, but you can choose which background you want to print. - Anyone that enjoys having fun while learning! 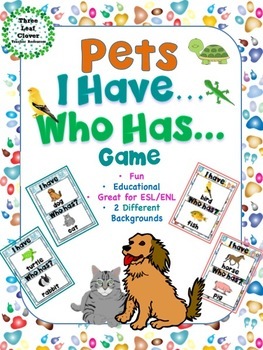 I hope you enjoy playing this wonderful game with your students while they practice vocabulary related to pets. Please check back often as I will be adding more I Have, Who Has? games. Copyright © 2018 Three Leaf Clover Teacher Resources. All rights reserved by author. This product is to be used by the original downloader only. Copying for more than one teacher, classroom, department, school, or school system is prohibited. This product may not be distributed or displayed digitally for public view. Failure to comply is a copyright infringement and a violation of the Digital Millennium Copyright Act (DMCA). Design and elements found in this PDF are copyrighted and cannot be extracted and used outside of this file without permission or license. Intended for classroom and personal use only. If you are interested in my products please look for the follow near the top of any page within my store and click it to follow me! - Please go to your My Purchases page (you may need to login). Beside each purchase you'll see a Provide Feedback button. Simply click it and you will be taken to a page where you can give a quick rating and leave a short comment for the product. Thank you for your feedback, I hope that you find my products useful and enjoyable. Clip Art provided by Whimsy Clips. 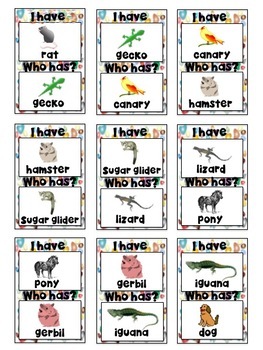 You can find all of my resources for English Language Learners here.